Southern blotting is the term given to the procedure of transferring DNA from a gel matrix to a solid inert filter. DNA samples, fragmented by restriction digests or PCR amplified, are separated by agarose gel electrophoresis (0.5-2.5% agarose), stained with ethidium bromide (0.5 pg/mL) and photographed to record the position of molecular weight markers and the fragments of interest. The gel is rinsed, the DNA depurinated by a HCl (0.25 M) wash, and denatured by washing twice in a denaturing buffer (1.5 M NaCl, 0.5 M NaOH). For the DNA to be transferred to the nitrocellulose filter, it is necessary to neutralize it by washing twice in a neutral, high-salt buffer (1.5 M NaCl; 0.5 M Tris-HCl, pH 7.0). For all the washes, use 5- to 10-fold gel volumes of each buffer and incubate at room temperature for 20-30 min with gentle shaking. Fig. 1 Overview of nucleic acid blotting procedure. a small weight (up to 500 g) at the top. The apparatus should be left overnight for optimal DNA transfer. Disassemble the blotting apparatus, leaving a compacted gel/filter amalgamation. It is paramount to mark the position of the wells on the filter and to nick one of the corners to allow correct orientation. To remove excess salt and prevent the filter from becoming brittle, peel the filter from the gel and soak in a 6 x SSC solution for 3 min before drying it on 3MM paper. 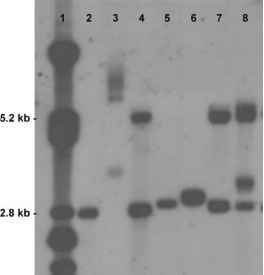 It is recommended to confirm the DNA transfer by restaining the gel with ethidium bromide. After the filter has dried, sandwich it between two sheets of 3MM paper and bake it for 2-3 hr at 80°C under a vacuum to immobilize the DNA by expelling any water. The filter is now ready for probe hybridization, although it can still be stored for several months in a dry, dark location.